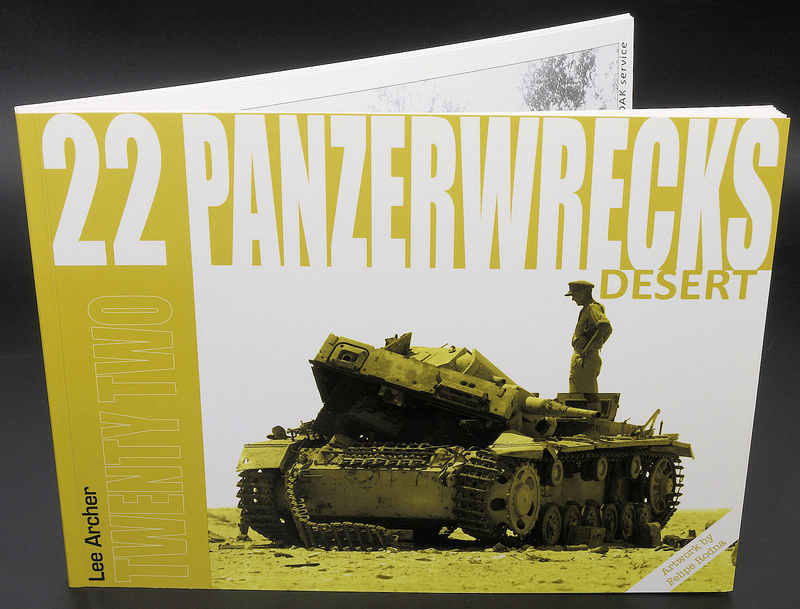 Read n’ Reviewed: Panzerwrecks 22 "Desert"
The latest in the Panzerwrecks series focus on a time before their usual focus of 1944-1945. We go to the deserts of Africa in this issue, at a time well before the regular timeframe back to the battle for the North African battlefields. This should provide us with some different vehicles and ground, so we were very happy to see this change of focus. However, twenty-two issues in, was this book series still any good? Those who know the Panzerwrecks series will see no real changes at first glance at this issue. An interesting colour palette with a black and white photo with the usual font on the glossy, softcovered front and rear of the book with the usual weight (ninety-six) pages making up this volume in the regular A4 landscape format. A lot of the images and information in this book was taken from a study by the 7th Squadron of the South African Air Force on the results of their attacks on enemy tanks. The fact that there is enough to make up a lot of this book is surprising. It must have been a boon for the publishers to find a trove like this. This volume of the series features two "featurettes" if you like, kind of two stories within the whole book, one being the use of captures "Allied Armour in DAK Service" while the other recounts the short story of the "Desert Hunter: 7·62cm Pak(r) Auf. GW 38(t)". These are both there inside all of the other pictures and captions, and you can see when you are reading about them as they are labelled at the top corner of the age you are reading. After a breif into by the author Lee Archer, we get into the book proper. 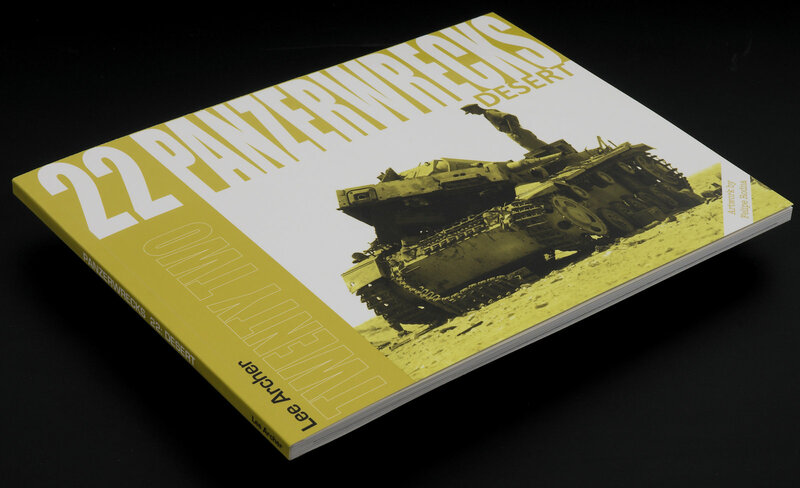 To those who do not know the general layout of these books, the Panzerwrecks series features rare or not before published pictures of World War Two AFV's and tanks on the battlefield. Usually, the landscape layout of the book enables us to be treated to these photos in a wide format - just like most of them are taken from the archives that the author and publishers continually unearth. Several of these pictures are large and of great quality, where others are smaller and in a lesser resolution or a vertical aspect. You can see the sample pages in the article below the large format and smaller picture styles that go right through this book. The pictures are not the whole story, however, the author and his co-authors in the other books of the series include usually a paragraph of text in English that describes what is going on in the images you are seeing, and often enlighten us as to where and when the pictures where taken with the "who" being the soldiers int he frames. I can see by the first pages that it is very hard to pin down locations in this featureless collection of desert terrain featured in this book. That does not stop the Mr Archer giving us as much of the detail as he can in these descriptions. The reader learns so much from this process of photos and written explanation as enforcement of knowledge to what is going on. It is my favourite way of learning in pictorial books and the author has done a fine job of shedding light on some unusual pictures in this issue. OK, so that's what the book is like physically, I will take you through the book and describe what is inside as much as is possible with the book's meandering narrative leading me on. 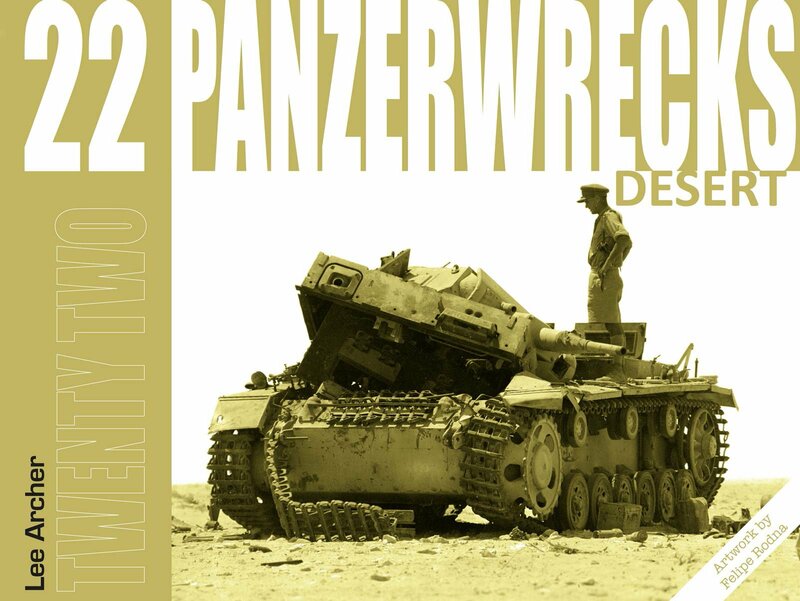 The first thirteen or so pages show us a single, and sometimes two pictures of several Panzer III's of different marques in various destroyed, immobile and stripped conditions. The author pics out where the tanks were shot and what has made them immobile, and even the most difficult detail like a farhgestellnummer (chassis number) on the driver's port that I completely would not have seen otherwise. The Panzer III's with the concrete over chicken wire applique armour were an interesting find also. 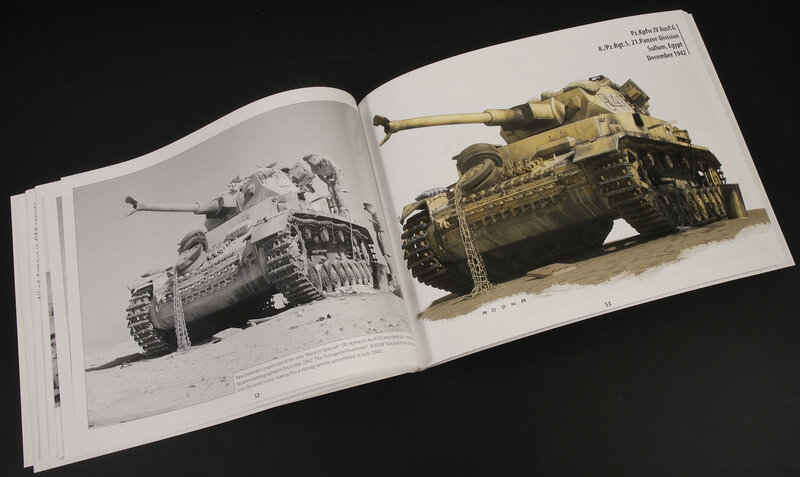 There are more Panzer III's all the way up to page 19, several pictures of the one in a series and some unusual extra tracks draped over the turret are an example of the others in this part of the book. We move on to more varied fare now, with the eight-rad vehicles of different types taking up the next nine pages. 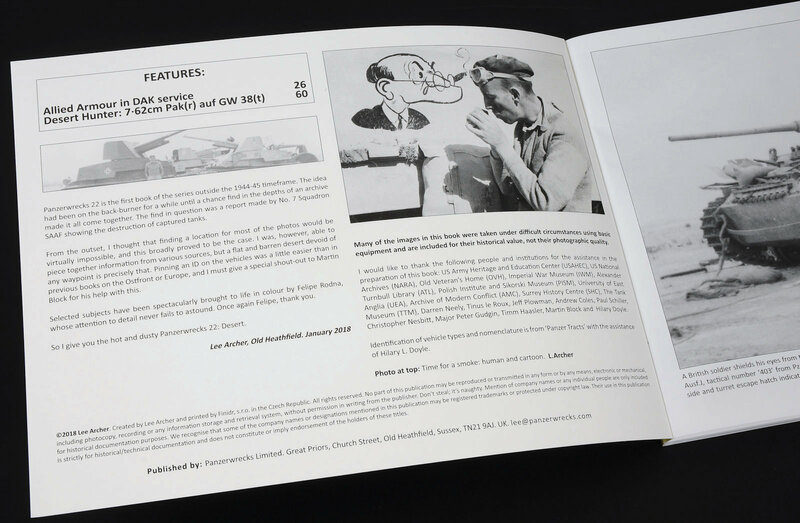 The interesting inclusion of the British Army's booklet with diagrams which instructed the soldiers how to operate and use the captured weapons they came across. A really interesting find one would think, as we can see in the book British soldiers either transporting, evaluating or simply driving these vehicles throughout these pages. The large gun of the 7.5cm 8-rad Sd Kfz 233 is captured (literally) by US troops on the next three pages, while we lastly see a similar Sd.KFZ 263 in three pictures in various states with Australian, British and one showin the graves of the crew next to the vehicle. We get into the first main "story" of the book next with "Allied armour in DAK service". This is the part of the book that comes from the 7th Squadron, S.A.A.F's studies that I mentioned earlier. The author has added the direct quotes from the study along with his own in slightly different text so you can see what has been added to or commented on by the author. 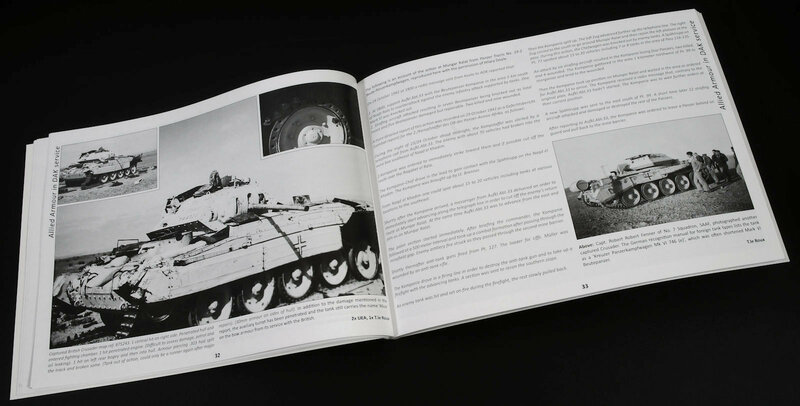 The black cross of the Afrika Korps can be seen on the M5 (Honey) tanks in various states of grizzly ends, we see captured then re-captured cruisaders over a few pages and several valentines with oversized balkenkreuz and german numbers on them with explanations of what the SAAF study found and what the author wanted to add. 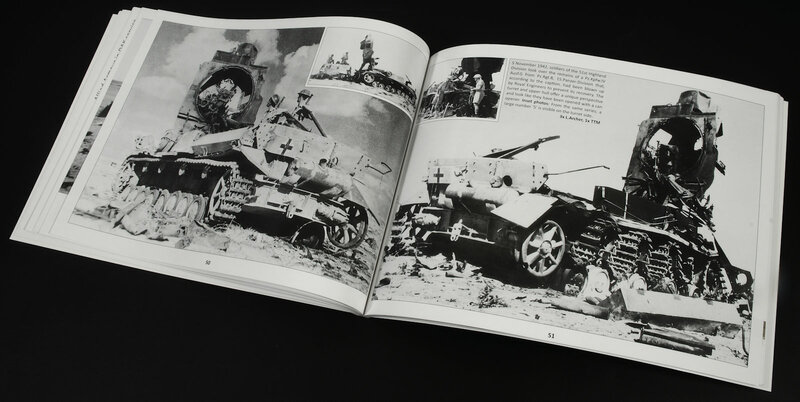 By pages forty we are looking at wrecked captured M3 Halftracks with German crosses, some painted with new German camo and some more hastily converted sees out this part of the book. we go back into regular pattern next with a series of pictures of German Panzer IV's next with some great pictures (with some great backdrops of the desert I must add) right up to page sixty we see these tanks on transporters, wrecked absolutely (see pictures below) and some in sequence as trophy pictures. What I have not talked about so far is the colour artworks by Felipe Rodna that are featured six times in this book. There have already been a few in here in preceding pages so I thought I must mention them. 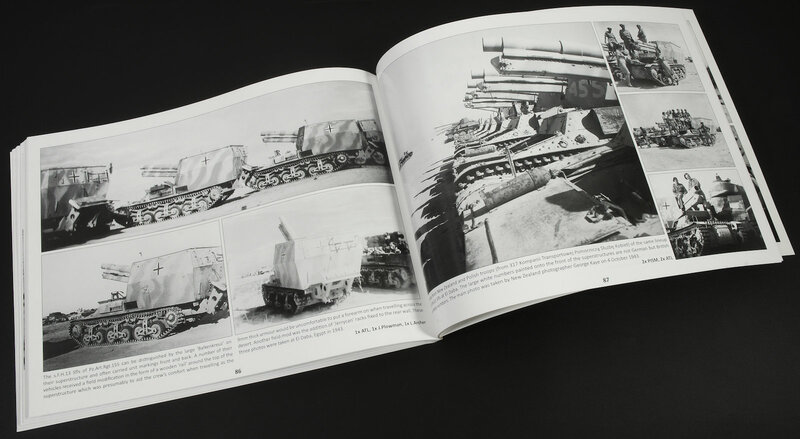 The colour reproductions of these tanks in almost a duplicate of the pictures, but flushed out with colour denoting wear and tear, colours and more importantly life into each of these black and white images that are shown on the pages opposite to them. These are a wonderful addition to the series of late and they add so much to the book from a modellers point of view. The second "feature story" if you like in this book is called "Desert Hunter: 7.62cm Pak(r) Auf GW 38(t). This tiny tank hunter is seen here in a few scenarios, the first few pages show the damage that an experimental rocket-laden Hurricane fighter-bomber did to the vehicle. Another showing the damage from various other sources, the author describing the scene in every picture, and with people in the pictures to show the scale of the tiny (but tall) tank destroyer. The study of this tank and what happened to it in several different scenarios goes right up to page seventy-six, this is the largest study of this particular vehicle I have seen in a book, and it gave me plenty of modelling ideas for my own 48th scale Tamiya kit I am making (soon enough I promise), and again some wonderful artwork helps! We go into the last part of the book now which features several different vehicles, two pictures of a completely blown away engine on an Sd.Kfz.9 leads into more Sd.Kf.250/251 half-tracks both in German and captured service. Mr Rodna has again provided an illustration of an interesting example (with vehicle insignia shown in detail) plus two illustrations in colour of the front nose of two of the half-tracks in the pictures. Several pages of the very portly looking SPG the Lg.s.FH13(sfl) are seen, I like this little SPG and so it's great to see them in numbers and different conditions in this book.These vehicles lined up from various places and colour schemes is interesting to me. 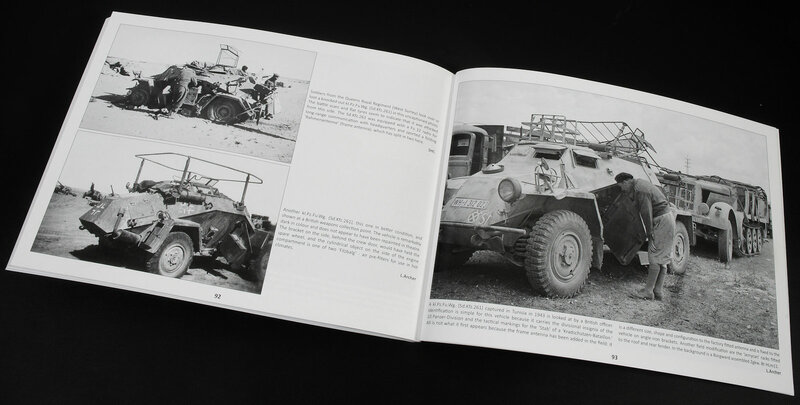 The last few pages give us two pages each of the not often seen Panzer I 4.7 Pak(t) that had been captured, three Sd.Kfz.261 radio scout cars being examined closely after capture, two pages of Panzer II's in desert schemes and lastly a picture of another SPG and the P39/40 that served as a personal vehicle to a British officer. SO - that is all (he) wrote in issue no#22 - and what do we think? Well first I like to point out the things that can be improved, and I am hard pressed to find anything here, I can't really think of any. This book is so well put together in its structure, the pictures are great and author's comments add so much to the scenes we are provided with. Technically it is a great addition. As for the heart, well this book has given me plenty of inspiration, the artwork by Mr Rodna adds so much life to these black and white pictures, and the time period and setting is an inspired choice. Going from the late war period to the Western Desert has I think, been a success here. Hopefully, there will be more of these from different theatres and times of the war to add to this effort. Thanks to the team at Panzerwrecks for sending this book for us to read and review. The book is now available from their website.